Today we welcome Australian author-illustrator Nicky Johnston! 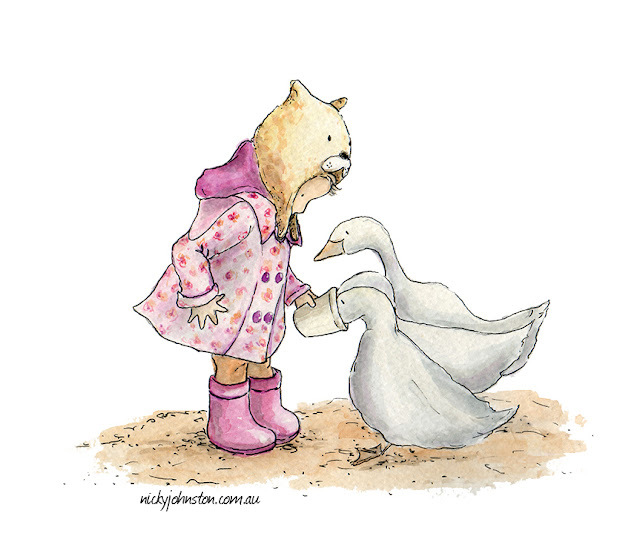 Nicky is the author-illustrator of four picture books. Welcome. I have loved to write and draw for as long as I can remember. I took art classes from nine years of age and have continued to paint and draw since. 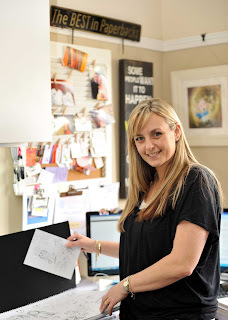 I am a qualified primary school educator with a Graduate Diploma in Special Education. I majored in art throughout my education, and I have run art classes for children over many years, with some students attending for 7-8 years consecutively. I have four children (all boys!) so it is not surprising that my first children’s book was inspired by my eldest son. 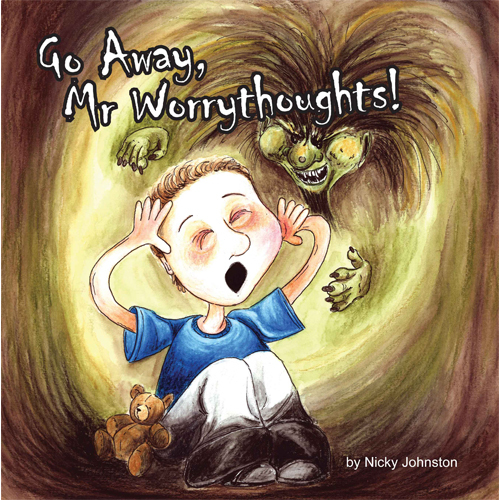 Diagnosed with an anxiety disorder at just five years of age, I NEEDED to write and illustrate a children’s book to help him understand what he was experiencing – this was the beginning of my career as a children’s book author and illustrator. Tell us about your latest book, as well as your other books. Do you have one that holds a special place for you? 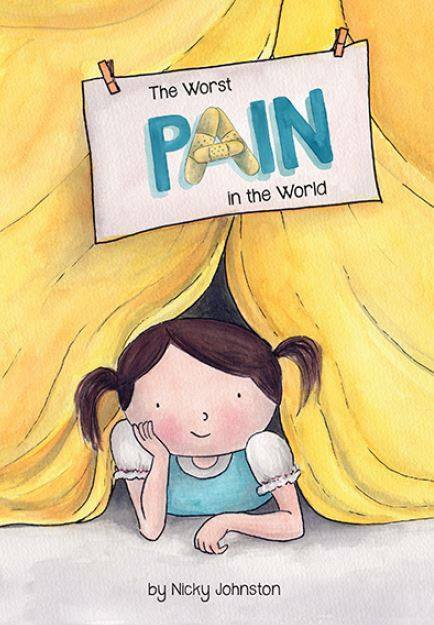 Last year, I wrote and illustrated a children’s book called THE WORST PAIN IN THE WORLD. It was published by Arthritis Victoria (an organisation supporting adults and children with arthritis). 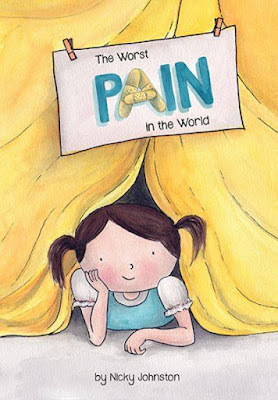 The story is about a young girl who lives with the chronic pain of juvenile arthritis. Although for her the emotional stress and anxiety of the condition is her greatest pain. Juvenile arthritis is more common than people realise, some children are diagnosed as young as 18 months and I am proud to have created a children’s book supporting these children. 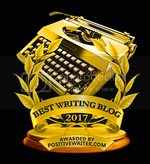 Of my four published books, my first book, GO AWAY, MR. WORRYTHOUGHTS! holds a very special place in my heart. Not only because it is based on my son, but because it has also helped thousands of children suffering anxiety worldwide. It’s been adapted into a theatrical production that tours primary schools educating children of helpful strategies in dealing with worry thoughts. It doesn’t matter how many times I see the performance, even now five years on, the show still fills me with emotion. I consider myself a traditional medium illustrator (I love painting and drawing on paper), but I also enjoy using digital software too. I am learning digital illustration skills all the time, and I enjoy the different style of artworks I can create. 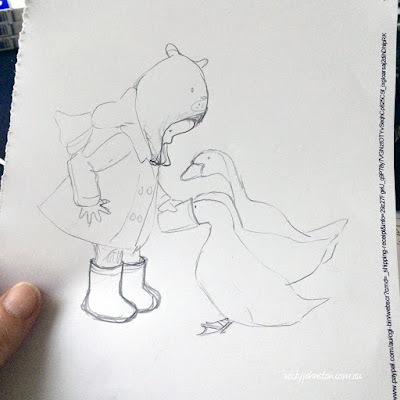 I love painting my illustrations in watercolours and pencils, so once I have finalised the rough sketch, I lightly draw it onto watercolour paper ready to paint. I tend to work on a few spreads or illustrations at the same time to help keep consistency in my characters. 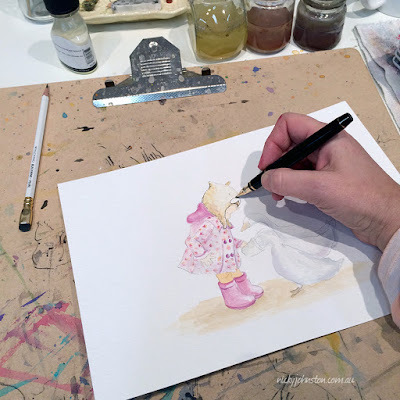 I am also quite impatient and don’t like waiting for watercolours to dry so it is not unusual to have a few different projects on the go scattered across my entire studio. I often add an outline to my illustrations. Sometimes I use a pencil or fine liner pen or I’ll choose my fine nib fountain pen to complete the illustration. 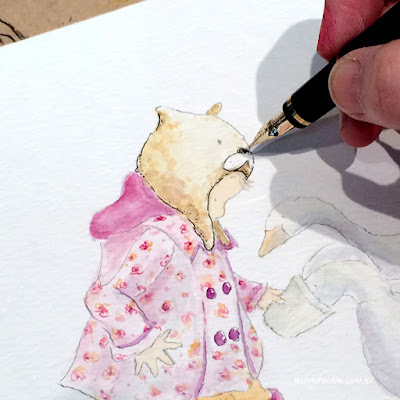 For the past two years I have been administrating the Facebook group 52-week Illustration Challenge originally founded by author/illustrator Tania McCartney. This year I took over as the Creative Director of the group. The Challenge provides an inspirational theme for members to illustrate every week of the year. We currently have a creative community of over 3600 members. As a result of participating in this challenge, I have produced an abundance of artwork, developing and improving my craft each week. 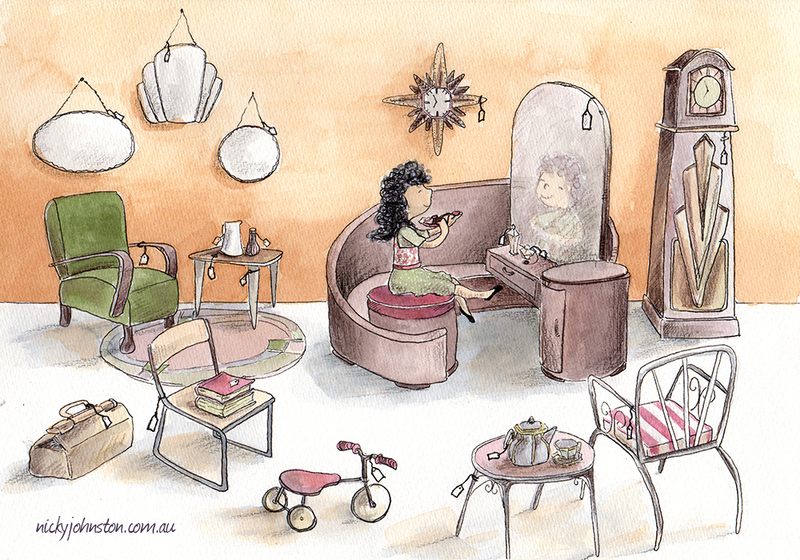 At the moment, I am working on a couple of commercial illustration projects (for other authors). 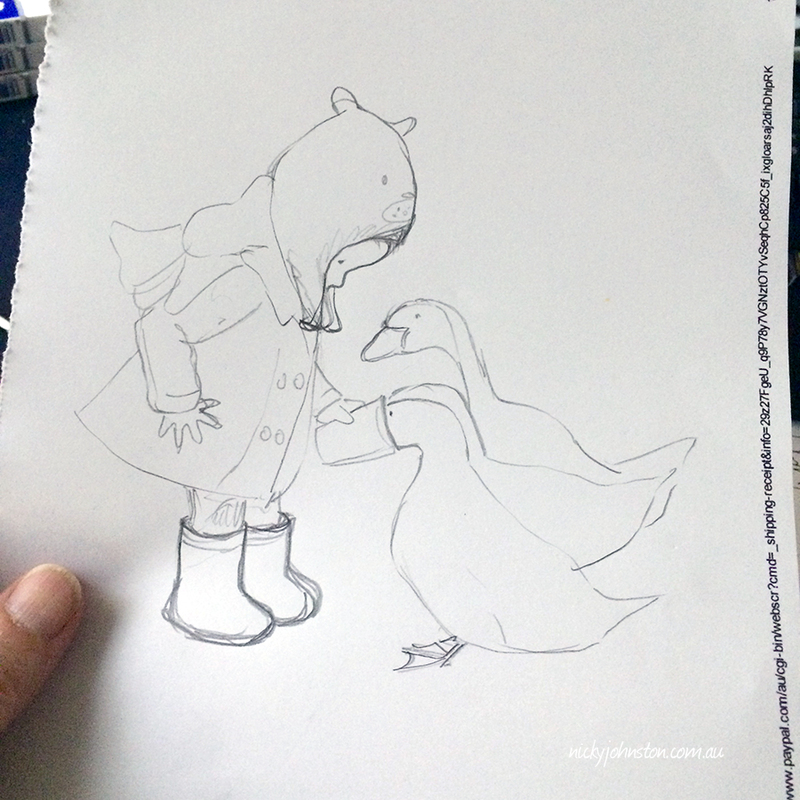 These are at different phases of the children book development process, giving me plenty of creative inspiration. 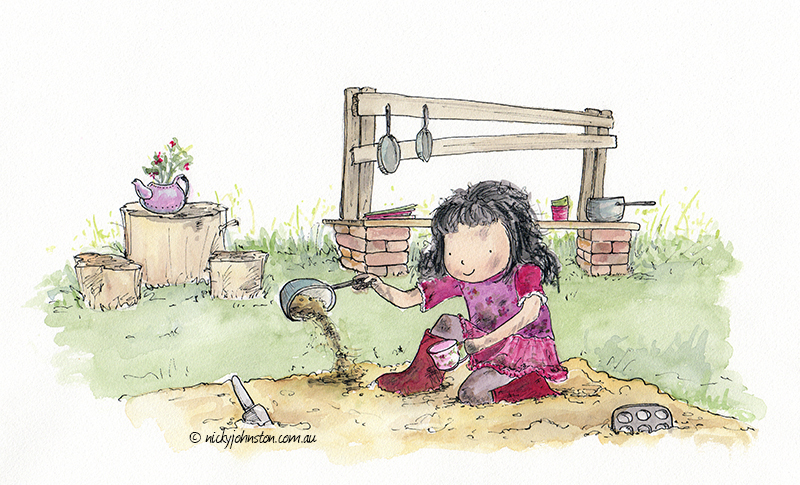 I am also finalising a couple of children’s book manuscripts of my own. One of them, I am hoping to move onto the illustration phase next year. For those passionate about being an illustrator I recommend drawing every single day. The more you create, the more you see and the more you see, the more you create! An illustration career can be very isolating and lonely at times, so I also suggest joining a creative outlet with others. Attending drawing/painting/printmaking skill classes, if you are able, and spending face to face time with other like minded artists can really help you keep in touch with your craft. If this isn’t possible, I highly recommend joining an online/virtual community. 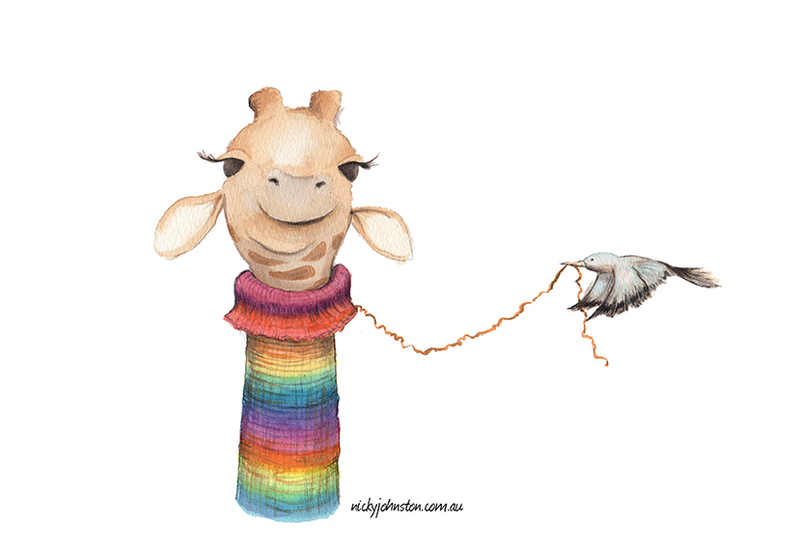 I have gained an enormous amount of support, encouragement and expertise from the 52-week Illustration Challenge community, making some fabulous friends along the way. My last piece of advice is to be creative not competitive. Whilst the commercial world of illustration is quite competitive, I believe we need to remain true to ourselves and continue to create from the heart. I derive such genuine joy from celebrating other artists’ works, successes and book contracts and I don’t feel the need to compare their journey to that of my own. Being creative not competitive, allows me to continue to develop, grow and reflect on my own creative journey at my own pace. A lot of inspiration for my artwork comes from my children, along with my own childhood memories. I love the freshness and innocence that children experience - in fact I wish I could bottle it! I am also greatly inspired by my mum. She saw my artistic ‘spark’ when I was very young and she helped me keep it alight. She gave me an abundance of paper, texts and a space to draw, paint and create. She encouraged my imagination and challenged my ability. She sought art classes for me and propped me up when I lost my self-confidence. I certainly would not be as brave and confident in my artistic ability if not for my mum. Most people won’t know that I am a 2nd Dan Black belt in Karate and with four boys, I think it is a great qualification to have! I also taught as a primary teacher in a remote Indigenous community in Northern Territory and I learned sign language while completing my Graduate Diploma in deaf education. 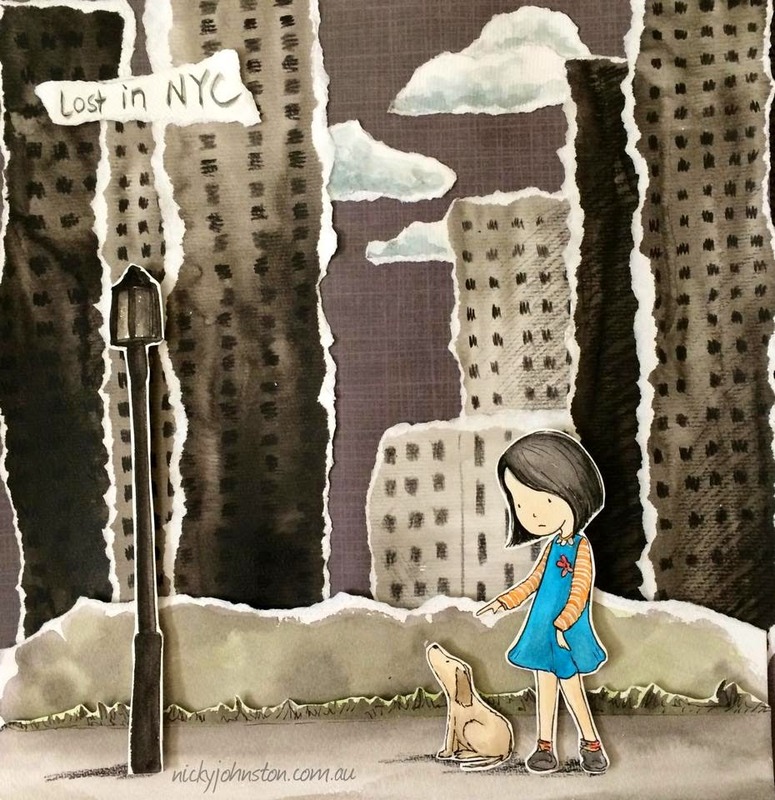 Nicky is an educator, speaker and author/illustrator of children’s books. She is passionate about promoting resilience in children and raising awareness of mental health issues. Her love of teaching sees her busy with school visits and presenting at workshops and conferences. I've seen Nicky's name pop up all over Facebook so it is nice to learn a bit more about her. I joined the 52 week challenge but haven't had a chance to actually participate. Love that painting of the girl with the geese! 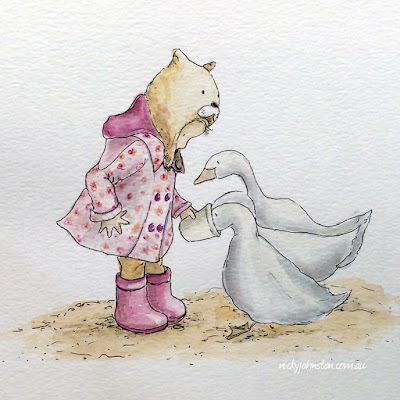 Good to see you on KidLit411 :) I admire your work and the love I see in it. Be creative not competitive! Yes! 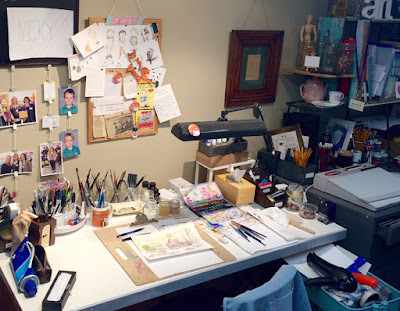 I interviewed Nicky over three years ago and she was already a fabulous artist then, but it is also wonderful to see the continued growth and evolution of her style! So glad to read more about Nicky and what she's up to these days! I will take her words of advice -maybe tack it to the bathroom mirror! - about how following your heart allows you to evolve at your own pace. Have fun with the challenge, Nicky! Wow, thank you everyone, especially to Kidlit411 for inviting me here - answering these questions required me to reflect on the last few years, which is something I need to do more of. Refection is such an important part of the journey, to celebrate successes (which are easily forgotten) and to evolve in style and goal direction. The opportunity to be in this 'spotlight' has reminded me to do just this. Thank you again. Wonderful illustrations! I'm in love with your goose girl.